It's Thanksgiving weekend in Canada. There is much reason for gratitude. Family, friends, health, jobs, freedom - the list is endless. Our family celebrated with dinner on Saturday night, and dry grilled ribs in place of the usual turkey. It was loud with the little ones in high spirits and so delightful. After the littles were put to bed we sat around talking, talking, talking. Good times. After church on Sunday we were invited to our son-in-law's parents for turkey dinner. It was most delicious - Sandi's stuffing was remarkable, the turkey moist and the company convivial. A walk through Butchart Gardens helped settle the meal a little. Autumnal colours are muted yet, with hopes of more vibrancy if the temperature drops a little. Drifts of bright leaves here and there. In the always-peaceful Japanese garden, mushrooms spring up from the moss, perhaps giving shelter to any garden fairies nearby. The stepping stones - always a favourite. The curved lines, the reflection, the hint of red in the background - serenely beautiful. The dahlia borders were anything but serene. Vibrant colours popped against the grey skies and drizzle. Pinks, reds, oranges, yellows, whites - in all sizes and shapes. These are just a small sampling. Wishing all my fellow Canadians a very Happy Thanksgiving Day! I'm thankful for the wonderful people I've met through blogging - I'm amazed by the kindred spirits who find each other on line. Thank you for your comments, your emails, and for reading this little piece of my life. Linking up with Mosaic Monday, hosted by Judith. Happy Thanksgiving to you! You holiday weekend sounds just perfect. With a walk at Butchart Garden it was even more special. Those gardens are so beautiful with every season, just lovely! Lovely post. Pity, we don't celebrate thanksgiwing here in Finland. - Beautiful japanese garden, the weather seems to be stil warm. Here is a late autumn, almost all the leaves are fallen. We are ready for winter to come. I enjoyed your photos so much. Happy Thanksgiving. Indeed,the Lord is good! Thank you for the dahlias and the Japanese garden - both so beautiful they fill me up. And for sharing your thankfulness and thankful day's joys. God bless you all and give you another year with blessings piling up. What lovely photos! autumn in Canada is grand isn't it! Happy Thanksgiving, Lorrie, it sounds as if you've had a perfect weekend so far. The photos from Butchart are stunning, so beautifully composed. Thanks for sharing your day there with us. We don't celebrate here, but it is lovely to read about other countries and their Thanksgivings. Lovely photos! This time I especially enjoyed seeing the beautiful autumnal colours and the dahlia mosaic. What stunning photos - beautiful. When I was in Bible School in Michigan, we always celebrated Canadian Thanksgiving, because we had break over American Thanksgiving, and had several Canadian students each year. I too love the way kindred spirits find each other, even online! Lovely post colored autumn,greeting from Belgium. Happy Thanksgiving, Lorrie! Loved seeing your images from Butchart Gardens. It is a magical place! How lucky you are to have an after dinner walk at Butchart. We're having leftovers for lunch today and then off to a hockey game in which our granddaughter's boyfriend plays. Then the long drive home, but it's been nice for the whole family to be together. Oh my your garden images are stunning...the bright green grass with the red leaves, and the mushrooms not mention the dahlias. What a special spot. Beautiful images...I especially like those brilliant red leaves on the branch. The autumn colors look so pretty where you are. Our colors aren't as bright yet. Always nice to see the Butchart Gardens, that we visited on our 25th! I love the color of autumn on a gray day and the dahlias are such a beautiful shade. I share your gratitude, it has been nice knowing you for quite a few years now! Happy Thanksgiving again. I'm glad the rain held off for your walk in the gardens. Cute mushrooms! Happy Thanksgiving! Great photos, and the flower mosaic is so pretty. Thanks for sharing your holiday with us. Thanks for stopping by and enjoy your evening. Wonderful post. I've always wanted to visit the Butchart Gardens and just now I got to visit a small portion through your lovely photos. Those Dahlias were gorgeous. Happy thanksgiving! Ah, Butchart Gardens is a delight no matter what time of year! Lovely scenes. And I love, love, LOVE that first photo of the feet! Let's see, which feet belong to who? I guess that yours are the ones in the black shoes, LOL. Happy Thanksgiving - and thank you for the lovely tour - the gardens are spectacular! Especially loved the red leaves and the Dahlias - splendid. Happy Thanksgiving to you. And thanks for such a lovely reminder of how beautiful a rainy day garden walk can be. Happy week ahead! Happy Thanksgiving to you and your family, Lorrie! Your photos are beautiful. It is a dream of mine to visit Butchart Garden one days! Happy Thanksgiving to you and yours! It sounds like you had a lovely time (times!) of celebration. His gifts are so many, --yes-- online friendships included! Thanks for sharing the wondrous views of Butchart Gardens. Both your celebrations of Thanksgiving sound wonderful, Lorrie. Your walk around Butchart Garden was certainly a feast for the eyes! 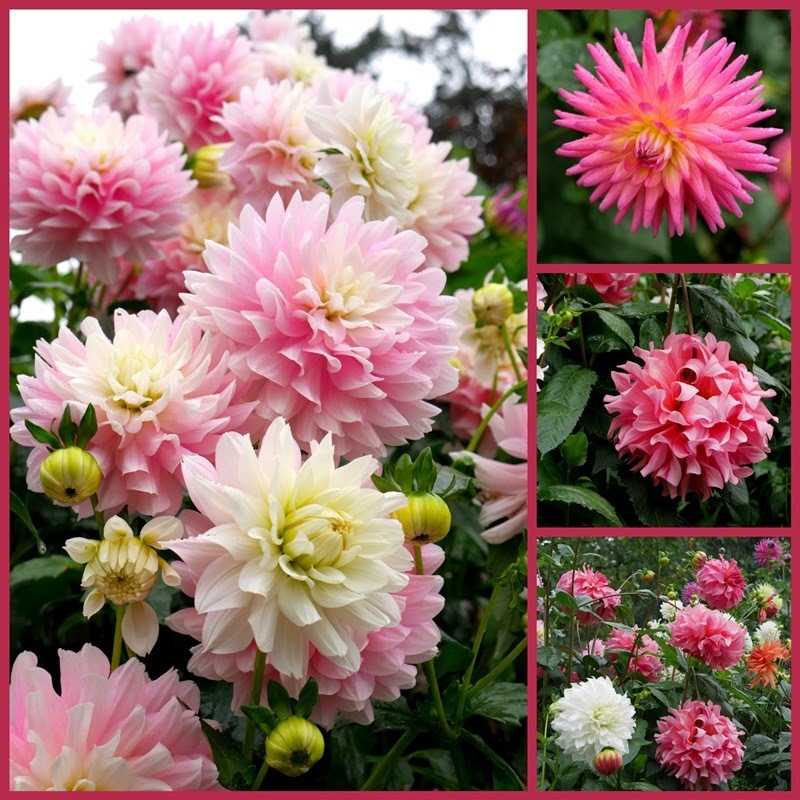 The hot hued leaves and bright Dahlia blooms are beautiful. What a lovely little escape into autumn. Happy Thanksgiving to you too Lorrie, it sounds like you had a great weekend! Your photography is beautiful! Love all the colors and those mushrooms especially. Happy Thanksgiving to you and yours! Love the photos of the dahlias, bright autumn leaves and mushrooms! What a wonderful Thanksgiving you had, and fantastic photos!. I am admiring the red leaves against the burgundy bush and the green grass such a wonderful mix of colours! What a wonderful Thanksgiving weekend....dinner (made my someone else) family and a walk through stunning gardens to bask in God's beauty. Sounds perfect!